The four actuators around the edges of the mirror primarily provide for tip and tilt and the simultaneous motion of the actuators provides piston motion along the z-axis. The two diagonal actuators support the weight of the mirror and prevent both side-to-side motions as well as twist. 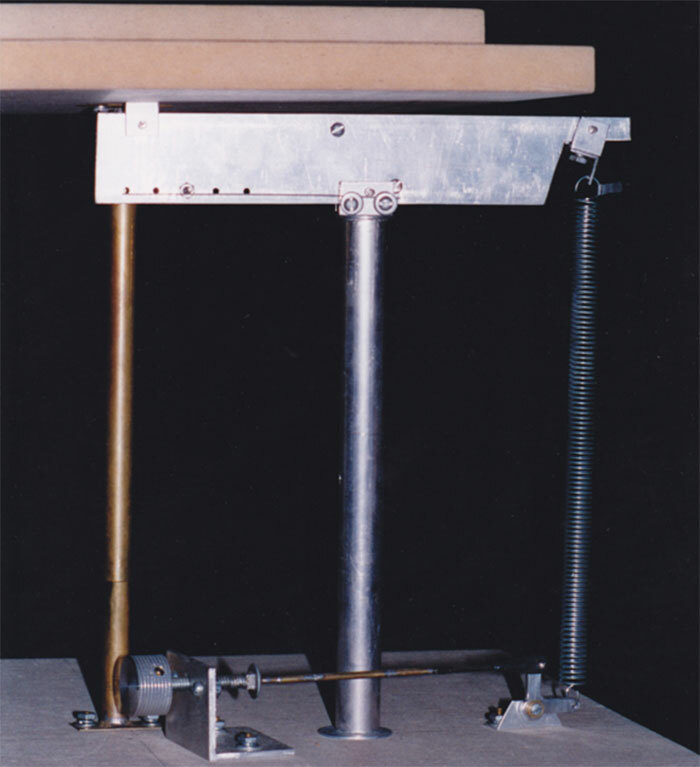 The modified Stewart platform features a fast inverse kinematics algorithm for reduced data processing delay based on a simple geometric configuration where the four actuators around the mirror are all parallel. The 50 mm diameter by 16 mm thick mirror shown in red is mounted to a four armed bracket shown in green. Four ball joints shown in black around the mirror are centered to the mirror front surface. Two ball joints to the rear of the bracket support diagonal actuators shown in black. The diagonal actuators support the weight and restrict side motion from side forces. Ball joints are placed at each end of the actuators to eliminate bending moments and to minimize sliding friction for the actuator. All of the actuators connect to ball joints on the fixed base plate shown in blue. The four peripheral actuators provide tip-tilt and piston motion. The simple 3-DOF configuration and the geometric layout of the actuators will provide a numerically fast inverse kinematics algorithm that converts tip, tilt, and piston commands to extensions for each of the actuators. The zero-spring rate vibration isolation mechanism suspends of floats an object and absorbs vibrations over a wide frequency range due to the rotations of the arm and the interaction with the support spring. This design provides greater frequency response bandwidth than a typical spring-mass damper configuration that operates as a second-order low-pass filter at a single resonant frequency.